I have raved about my sister's refrigerator before. She's a maniac in the kitchen. Otherwise, too. Just like my other sister. Our husbands seem to think that it's a trait that runs in the family. It's amazing how corny and tired that conversation is but they never fail to rewind and replay every time they talk. Each has a story that they are sure will win them the award of having married the craziest of the lot - like it's some sort of competition or something! - and that tells me who is totally off his rocker. But after I tell you this story, you might agree that it is my eldest sister who is truly nuts. She got a call from her podiatrist insisting that she come in to show them the toenail she hurt while playing tennis. They said they would squeeze her in. She shuffled her own patients and went for her appointment. 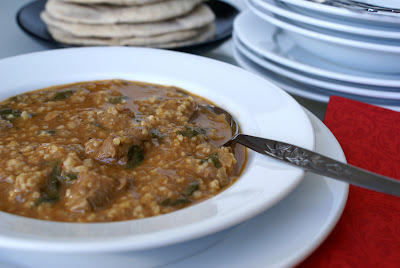 While she waited, she says she started salivating as she read a recipe for a spicy stew, a Tunisian lamb stew. She read and re-read the recipe. 15 minutes passed. She went back to it and read it again. More time went by. She closed her eyes and started testing herself on the ingredient list and method. Soon, she could recite the recipe backwards. After 45 minutes, she couldn't wait any longer as she had patients of her own to see; so she left without seeing the podiatrist, but with a recipe imprinted on her brain. To this day, she insists that she was called to the podiatrist's office just for that recipe. If you are like me, you might be thinking: why didn't she ask for a pen and paper and copy it down? But she's not like me or you, so she memorized it. It's a skill that works well for her patients, too, because she remembers obscure information that helps her make a pre-diagnosis that the specialists only confirm. She also left the podiatrist's office in a very calm frame of mind. Again, not like me or you. 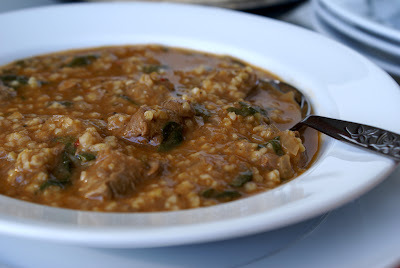 The last time we visited her, she had made this Tunisian lamb stew specially for me. I recreated it over six months later and it's vying with marag for the spot of the ultimate comfort food. It's that good! Tunisia is in North Africa with a coast along the Mediterranean Sea. Tunisia has a rich cultural heritage as well as history, having been conquered by the Romans, the Arabs, the French, and the Turks until the country finally won its independence from the Ottoman Empire. Its people are known for their hospitality and they also have a deep regard and love for spice. Tabil is a popular Tunisian spice mix of onions and garlic dried in the sun. I am still looking for the original recipe as a project for the summer of 2008. In a large bowl, season the lamb with salt and very liberally with fresh coarsely ground black pepper. The more black pepper you add at this stage, the better it tastes. But don't add more than you can handle, of course! Dust the lamb with flour so that it is well-coated. Heat olive oil in a large kadhai at medium-high heat. Add the lamb, shaking off excess flour. Cook the lamb, turning occasionally, until the meat is brown on all sides. This takes between 10-15 minutes depending on how tender your lamb is. Transfer the lamb to a large platter or bowl. What you will be left with in the kadhai is a thick dark brown roux. Reduce the heat to medium-low and add chopped onion, minced garlic, grated ginger, cumin powder, coriander powder, and red chilli flakes. Cook for 5-10 minutes to toast the spices and soften the onions. Add the tomato paste and 2 cups of the chicken broth and stir well. Return the lamb to the pot, increase the heat to medium, cover, and cook until the lamb is fork-tender. It took about half hour for me. While the lamb is cooking, cook 1 cup of bulghur in 2 cups of chicken broth. Adding more broth, if required. Also, clean, chop and steam the spinach and set aside. Add the remaining 2 cups broth (4 cups, if you want a real stew, one that is not dry) and bring to a boil. Turn off the heat, add the spinach and bulghur and stir well. Serve with warm whole wheat pita bread. It helps to do your prep work in advance and have everything ready for use. Mise en place, if you want to get all French and fancy. I used low sodium organic chicken broth, sold in tetrapaks. Usually there are about 4 cups in each tetrapak. Using 6 cups of broth would have left me with 2 cups of chicken broth languishing in the refrigerator, so I decided to use it. It was a great move because the stew thickens and the bulghur also absorbs a lot of the liquid as it expands further after adding it to the stew. I roasted 1 tsp of whole coriander seeds and 1 dried red chilli (byadgi), allowed it to cool and then pounded it coarsely in my mortar-pestle. Don't do this if you prefer coriander powder to coarsely ground coriander. I added 1 tsp of red chilli powder in addition to the red chilli flakes. I followed Anita's recipe for whole wheat pita, except that I did not use any all-purpose flour (maida). I used 2 cups of King Arthur's whole wheat flour and 2 cups of King Arthur's bread flour. That bread flour is so smooth and silky, it's unbelievable! I needed more than 2 cups of water to knead the dough. I used my convection oven at 475F and the pitas puffed up every time like a charm! 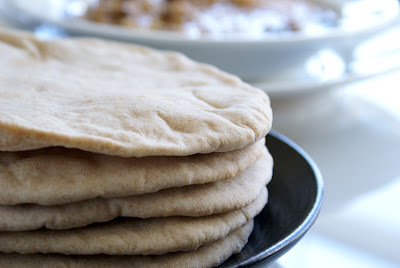 These are the best whole wheat pitas I have ever had! I am going to be making them over and over again! Not only are they easy to make, the clean up is a snap. Nothing compared to the mess that goes with making rotis, even though the pitas have to be rolled out. I wondered whether we really needed the whole wheat pita when there was bulghur in the stew. I tried eating it without pita and you have to believe me when I tell you that there is something very wholesome to dipping a piece of warm pita in that stew, and carrying it to your mouth. It makes the dish complete on some levels that I cannot describe or explain. Did I not fortell that you would be cooking something from the M.E. quite soon? Love the incidental roux and deglazing in this recipe, but I am aghast at your mortar-and-pestle skills! It's pound pound pound sift pound some more sift until just one little speck is left...which I ceremoniously place in my navel for good luck. :-D But I do like coarse-ground coriander too. Totally I agree with you on pita being less of a mess than roti, but then again no need to wait for the yeast-action; it's a give and take. Oh! Intriguing recipe, definitely a must-try! Nice story- remembered how I mugged the carrot cake recipe in a crossword bookstore as I did not want to buy the whole book! It's fun to have a foodie family :) The pictures for click are dramatic - very beautiful! It's settled - I'm not like your sister. I would have tried to memorize the the recipe but I would definitely not left in a calm state of mind. I'll be making this soon enough since you say it is that good. I have all the ingredients except the meat...which will be fixed pronto. And I'll be making the pits too - I am with you on the dunking-in-the-curry bit totally. it keeps the (Indian/Asian) food pyramid in order too. I got try your sister's trick just to get my brain working... Good for her- I don't think she's crazy at all... Very smart, I would say. He he, wonder what your sisters have to say :-D. I am not too good at memorizing recipes, but it ultimately works out if i like the idea ;). For now, i am thinking that should make a vegetarian version of this stew with fried eggplants and i know it will taste good! I assume Sis's toe survived. lol....awesome recipe...awesome blog! i have recently been venturing my way into indian cooking and found this blog. I love it! Keep up the good work! Pelicano, you are my crystal ball! What would I do without you?! I made pitas again yesterday and it's just so much easier. I also eat less cos they fill me up rather quickly! Nandita, why am I not surprised?! You medical doctor, you! Anita, you mean I can start liking you now?! She could have copied it down. Her handbag is bottomless - like her fridge. She wouldn't even have had to ask for a pen and paper. She could have borrowed the magazine. It's a good thing she didn't rip out the page though! So...did you make it? Increase the red chilli flakes or add some of that habanero powder instead. Happy cook, I can't remember dates or names or numbers anymore. I had to step out of my own house to confirm my street number once. Try this stew, HC, it's hearty and very nourishing! Rina, let me know what you think. Shankari, you just reminded me that I have to return a Cooking Light magazine. :-D Nothing shameless about it! MarysMom, trust you to come up with a twist to this whole thing! My sister's smart alright but she's crazy, too! musical, each thinks she is the most sane, of course! I have been trying to figure out a veggie alternative, too. You'd need to make a roux and use vegetable stock. A meaty veggie like eggplant would work well, yes! Dudhi, also? Or some root veggies? Swaroopa, thanks and a Happy new year to you, too! Kitt, all appendages are in very good health. Her 50th is coming up in a couple of weeks and she's in much better physical shape than me! Hey, it looks like you've become quite the nightbird! George, I hope you have fun! Best wishes with your blog! That looks amazing -- I am trying to convince my sister to go to Tunisia this summer! And the recipe for whole wheat pitas sounds great too! I don't eat lamb but my hubby was drooling at it when he saw this. Looks so tempting and good. Just catching up with my fav sites during a hectic new year, so when I landed on your Month-of-Silence event, I just had to laugh and heartily agree! I'm glad everything worked out with your roof and your health. We are going to have to try this lamb stew after my dad leaves (he can't have any red meat), it looks and sounds pretty intense.